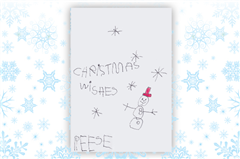 This custom holiday card was designed by 4 year old Reese. She was sick with Acute Myeloctic Leukemia. “Reese is a lovable, happy, giggly girl… and loves to draw”.